71 ACRE LAKE PROPERTY! This 2,500+/- SF home sits on an elevated site overlooking the lake! The main home features many upgrades: Rinnai water heater, 2 x 6 exterior walls (excellent insulation) 2 bedrooms + office or could be converted to 3rd bedroom, a very functional kitchen centered between the family room & dining room. There is also a large 2nd structure that can be used as a apartment or guest quarters, (with just a couple of upgrades.) There is a very nice storage area or room upstairs above the garages. Also, included in the additional structure is 4 car garage (parking area for 4-5 cars) + 3 car carport parking areas. If you need storage, look no further...there are plenty of secure storage areas. 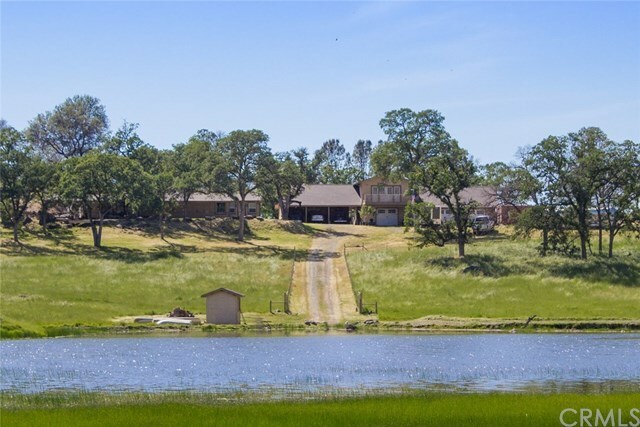 All of this is nestled in the back of this gorgeous 71 acre property which is level to rolling terrain, perfect for a vineyard or crops! Watch the virtual tour to see just some of what is offered here. Priced to sell! Directions: Hwy 140 to Hornitos Rd. 1 mile to Mc Cay Road, left to address on the right.